Surrounding Meosha Thomas are groups of sweating, exhausted veterans. They are being pushed to their breaking point as instructors and trainers circle, shouting encouragement to drive them forward mentally and physically. As she recounts her experiences at a recent Wounded Warrior Project® (WWP) event, it’s easy to become lost in her story. The unrestrained passion in her voice recounts her experiences at the WWP sponsored fitness expo in vivid detail. It’s a scene straight out of Meosha’s Navy boot camp days, except that the faces around her look nothing like they did in those days. They certainly look nothing like the stereotypical Hollywood boot camp, made famous by movies like Full Metal Jacket or Jarhead. Meosha pauses before presenting a challenge to that long-established image. At the EXOS facility at the Mayo Clinic in Rochester, Minnesota, Meohsa is surrounded entirely by women who have been wounded in combat. WWP staff and trainers work hard to meet the wounded service women where they are their recovery. Meosha reflects that the injuries are as diverse and unique as the women in attendance. Though the training is tough, there is a sense of healing during the workout that lifted Meosha’s spirits. Side by side with people who understand one another, Meosha understands this is her new normal. For Meosha, there’s another, lingering struggle she faces daily. Her tone of voice changes almost immediately as she talks about the work she does in her community. The WWP event is a good start, Meosha explains, because she and many other female veterans enjoy being with their peers, those they have common bonds and shared experiences with. In her view, there’s a unique healing this female-specific support can generate. As she walked away from the fitness expo, Meosha’s body and outlook had changed. 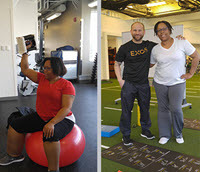 Her previous experience with personal training left her feeling discouraged, and without a clear path forward in her physical recovery. Most significantly, it took a toll on her mentally. Like all who attended the expo, Meosha received access to an online workout platform to help her stay active and healthy. When asked about her biggest highlight from the expo, newly forged relationships seem to take first place. To learn more about how WWP serves warriors at no cost, please visit https://goo.gl/96wCIy.